GSM has turned 24 this year and throughout this time showed that it is invaluable for telephone calls and M2M applications. Many industry observers estimate that 2G will continue to be in use even after 3G is discontinued. But GSM networks are confronted with the difficult task of adapting to the new operating environments. The modernization of GSM is particularly arduous when considering that equipment vendors and solutions providers have concentrated on developing components for newer networks (3G, 4G, even 5G) and less on innovating GSM network components. The SatSite is designed to serve either GSM, LTE, or mixed GSM/LTE networks working directly with the unified core YateUCN, proving that there’s still plenty of room for innovative results for GSM deployments. The technology behind our GSM network equipment allows new techniques like radio resource sharing with LTE, running GSM from a remote radio head, applying SON or beamforming technologies, which are typical for LTE, to be applied to 2G networks. The result is a simplified and flexible network architecture, better management and reduced costs. The SatSite base station is based on commodity, off-the shelf,-hardware and can be software-‘switched’ to provide either GSM, LTE, or both. When running YateBTS for GSM, it communicates directly with the unified core network, eliminating the base station controller (BSC). 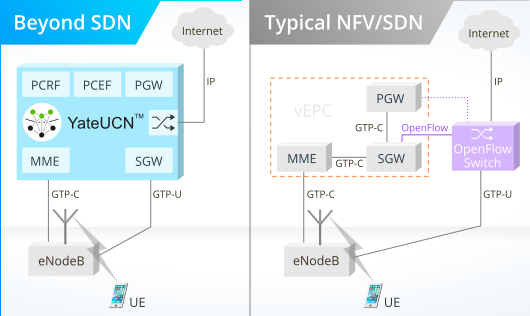 This architecture, where the BTS connects straight to the core network and communicates to other BTS in the network over peering protocols is very similar to the architecture of LTE. This is also what makes it possible to support multiple technologies in the same equipment. If one BTS uses the same frequency bands to provide both GSM and LTE access, operators may choose freely on how to allocate spectrum between them. Depending on the service use at a given time, operators can assign prioritize voice over data services and vice versa. 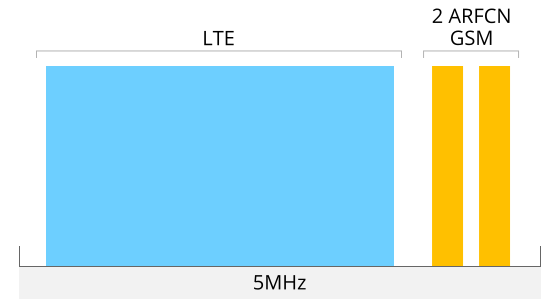 We’ve detailed spectrum sharing between GSM and LTE in the SatSite ​here. ​SON techniques feature dynamic self-configuration, self-optimization, and self-healing functions, which can be achieved due to the eNodeB not being controlled by a distinct BSC component as in the typical case of GSM. Without a BSC, SatSite base stations are able to connect to each other over peering protocols, allowing an exchange of neighbor information between units. 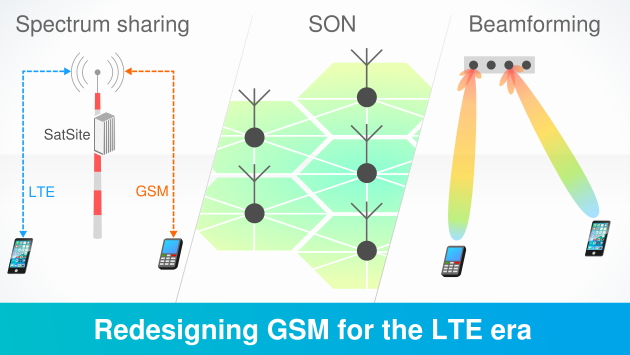 This ​presentation offers more details on SON technology for mixed 2G/4G networks. ​Beamforming relies on grouping the signals of multiple antennas and into one beam sent to a desired direction. It aims to reduce interference and obtain a better quality of a service for a certain user. 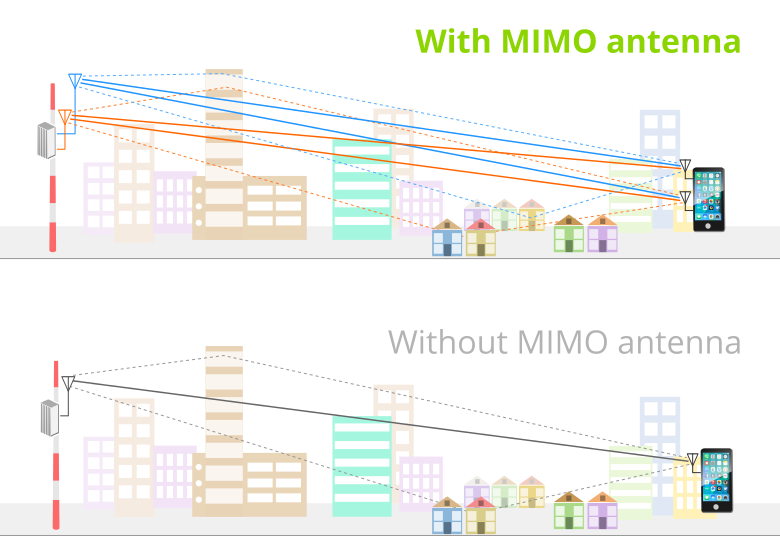 Unlike ​MIMO, where the network sends different parts of the data stream on different antennas, beamforming combines the signals from the different antennas and sends them to one device. What’s more, as opposed to MIMO, beamforming does not require any support from the handset, making it suitable for use in any mobile network technology, be it 2G, 3G, 4G or even 5G, in the future. 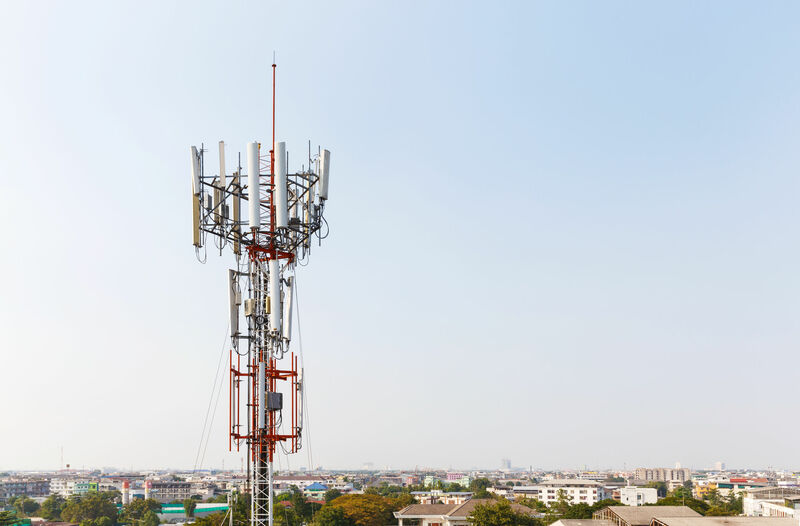 Benefits of optimizing GSM networks include a better management of the network resources, reduced infrastructure costs and maintenance efforts, and the flexibility to upgrade or reprogram network functions. The emergence of VoLTE-capable devices is raising new security concerns for mobile network operators, as existing IMS deployments expose vulnerabilities in VoLTE handsets to other devices in the network. YateUCN unified core network brings a solution to these concerns by isolating SIP and RTP call legs between handsets. LTE uses an IMS network to deliver VoLTE (voice services), and does so via Session Initiation Protocols (SIPs). This makes the IMS network act as a SIP proxy, performing routing, session control, and registering the UE to VoLTE. Voice is delivered through RTP from one UE to the other. Therefore, in case of a security attack, it is theoretically possible for a third party to send additional information through a forged SIP message via the IMS, to the target UE. Voice communication in 4G LTE can also be subject to malicious acts at various layers of the channel, including at the IP packets level, the UDP, RTP, or even the codec level. What’s more, SIP is also implemented directly in the baseband processor of the latest generation smartphones to allow subscribers to use VoLTE, making it easy to for a potential smartphone takeover to occur. For SIP signaling, YateUCN acts as a Back-to-Back User Agent server, ensuring a secure transmission of data. B2BUA allows SIP communication from the originating party (or User Agent) to be terminated at the one side of the network, where the message is verified. Any harmful information included in the received SIP message is eliminated and the message is recomposed to include only the information needed for the SIP to reach the end party. The risk of attacks decreases since malicious data is not automatically allowed to pass from one UE to the other, and the split SIP messages are negotiated independently on the originating and terminating sides. Unlike current IMS deployments, YateUCN allows the same message decoding, verification, and re-encoding of RTP by acting as a proxy. This also simplifies the deployment of Voice over LTE, since handsets only need to connect to YateUCN server. LTE for bandwidth and GSM for voice are a match made in heaven for subscribers. The roll-out however, not so much. Running them both from the same radio equipment (BTS) can be the answer. SatSite can run both YateBTS (GSM) and YateENB (LTE) at the same time, in the same spectrum, using the same radio hardware. This is made possible by replacing commonly used FPGA and DSP boards with one Intel Atom chipset. Both the GSM YateBTS and the LTE YateENB are modules implemented in software, allowing the base station to be reprogrammed or reconfigured to support new protocols. A base station can run GSM at first, and can be later software-upgradeable to LTE, running multiple air interface protocols using the same radio, at the same time. From a spectrum point of view, as seen in the image below, the mixed GSM/LTE technology enables a base station to be software-configurable for up to 4-TRX/ARFCN. A base station can use the 850, 900, 1800, and 1900 MhZ bands for both GSM and LTE, meaning that it will allocate two ARFCN to GSM and will use the remaining spectrum for LTE. Based on the subscribers’ activity (data vs. voice), operators can assign in software the spectrum priority for either LTE or GSM, so LTE gets a higher priority if there is a lower use of voice services. This optimizes the resources allocation in the network and supplies better access to users. Yate is an underlying part of the software architecture of our mixed 2G/4G RAN. It has a highly expandable architecture that provides unified management and monitoring. Both YateBTS and YateENB are software modules based on Yate. 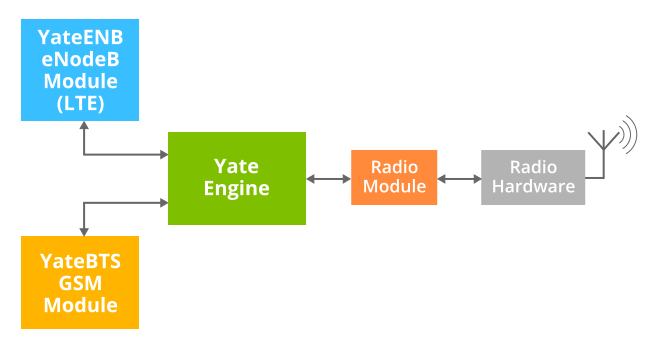 Yate’s SDR architecture enables the LTE and the GSM modules to use the same radio hardware. You can find out more about Yate’s multiple modules here. Yate’s SDR architecture also enabled us to replace the conventional, special purpose equipment combination of a baseband unit (BBU) + a remote radio unit (RRU), with a single unit. With this technology we implemented all the functions of both a conventional base station and a base station controller, eliminating the costly Abis interface for traffic and signaling, as well as partial functions of an Mobile Switching Center (MSC), in terms of mobility, power and frequency management and handover. The mixed 2G/4G RAN technology is embodied in our SatSite base station. SatSite acts more like a conventional eNodeB, even when running on GSM, because it uses IP backhaul for both 2G and 4G. It also contains the IP list of all neighboring SatSite units. 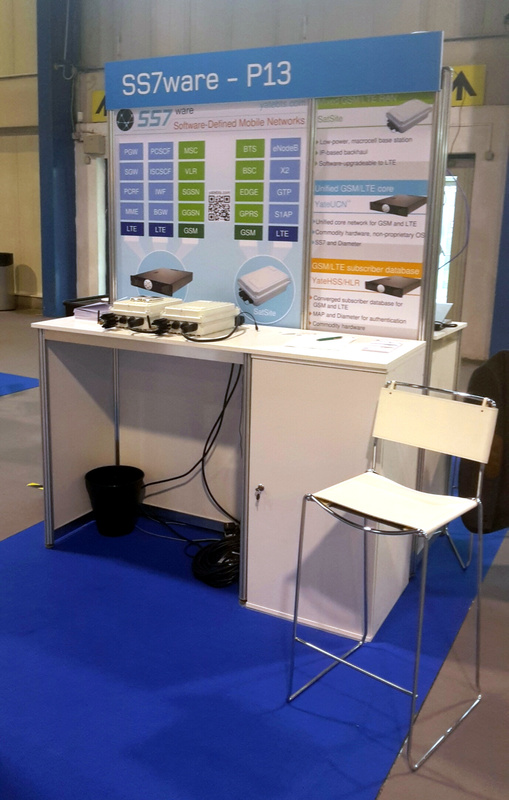 Using off-the-shelf hardware and a generic operating system, SatSite embraces everything SDR stands for, and is the solution for an easy adoption of new standards or technologies, even 5G in the future.